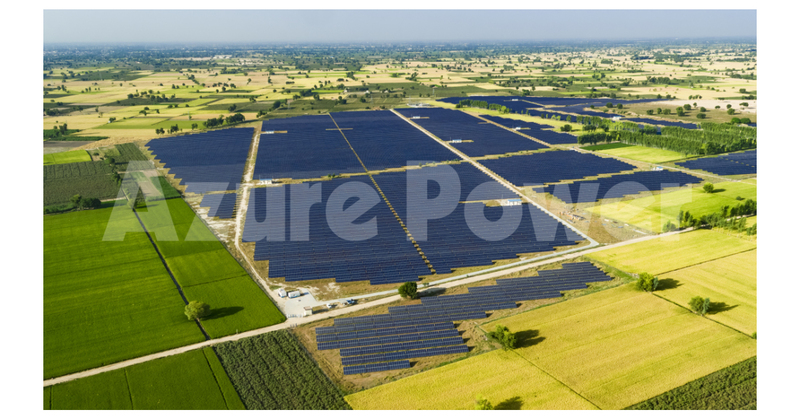 NEW DELHI–(BUSINESS WIRE)–Azure Power (NYSE: AZRE), one of India’s leading independent solar power producers, announced the commissioning of a 40-megawatt (MW) solar power plant in the state of Uttar Pradesh. Spread across an area of approximately 225 acres, the project has been setup under the government’s National Solar Mission Phase-II Batch-III Tranche III. The project was auctioned by Solar Energy Corporation of India (SECI), a Government of India enterprise which has a AA+ debt rating by ICRA, a Moody’s company. Azure Power will supply power to SECI for the next 25 years at a levelized tariff of INR 4.92 (~US 7.7 cents) per kWh, which is inclusive of Viability Gap Funding (VGF). Uttar Pradesh is the most populous state in India and has a large peak energy supply deficit, according to the Central Electricity Authority. In addition, CRISIL projects that over 10 million unelectrified households will be connected by 2019. Azure Power is one the largest solar developers in Uttar Pradesh and built the first utility scale solar project in Uttar Pradesh in 2015. Azure Power (NYSE: AZRE) is a leading independent solar power with a pan-Indian portfolio. With its in-house engineering, procurement and construction expertise and advanced in-house operations and maintenance capability, Azure Power provides low-cost and reliable solar power solutions to customers throughout India. It has developed, constructed and operated solar projects of varying sizes, from utility scale, rooftop to mini &amp; micro grids, since its inception in 2008. Highlights include the construction of India’s first private utility scale solar PV power plant in 2009 and the implementation of the first MW scale rooftop project under the smart city initiative in 2013. For more information, visit: www.azurepower.com. This press release contains forward-looking statements within the meaning of Section 21E of the Securities Exchange Act of 1934, as amended and the Private Securities Litigation Reform Act of 1995, including statements regarding the Company’s future financial and operating guidance, operational and financial results such as estimates of nominal contracted payments remaining and portfolio run rate, and the assumptions related to the calculation of the foregoing metrics. The risks and uncertainties that could cause the Company’s results to differ materially from those expressed or implied by such forward-looking statements include: the availability of additional financing on acceptable terms; changes in the commercial and retail prices of traditional utility generated electricity; changes in tariffs at which long term PPAs are entered into; changes in policies and regulations including net metering and interconnection limits or caps; the availability of rebates, tax credits and other incentives; the availability of solar panels and other raw materials; its limited operating history, particularly as a new public company; its ability to attract and retain its relationships with third parties, including its solar partners; its ability to meet the covenants in its debt facilities; meteorological conditions and such other risks identified in the registration statements and reports that the Company has filed with the U.S. Securities and Exchange Commission, or SEC, from time to time. In the press release, portfolio represents the aggregate megawatt capacity of solar power plants pursuant to PPAs, signed or allotted or where the Company has been cleared as one of the winning bidders or won a reverse auction but has yet to receive a letter of allotment. All forward-looking statements in this press release are based on information available to us as of the date hereof, and the Company assumes no obligation to update these forward-looking statements.